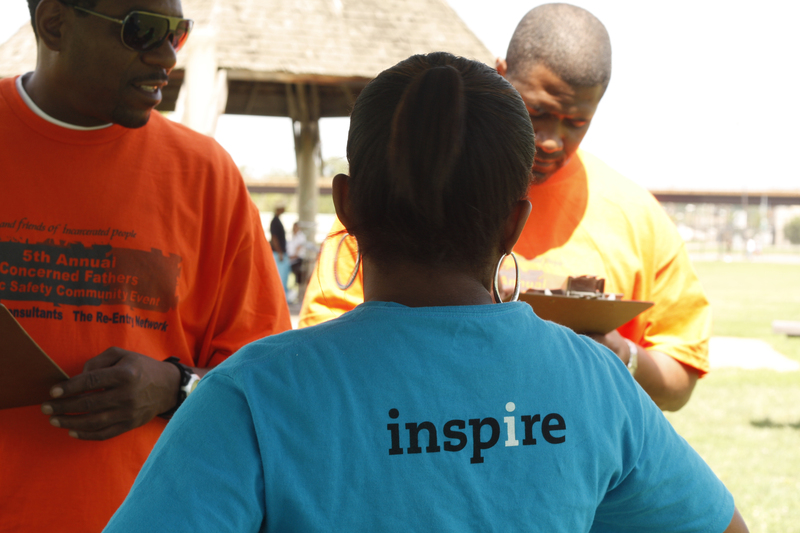 PMC fellow Brittany Clemons helps out event organizers Kenneth Baldwin (right) and Daryl Johnson fill out PMC surveys at the 5th Annual Concerned Fathers Cookout at River Terrace Park on Aug. 14. Photo courtesy of PMC fellow Danielle Scruggs. Secretly, I wish there was a reality show about the project because I want to see how they’re making it work. Many public media projects claim “community engagement” as a priority, but few make it the centerpiece of their work. For the Public Media Corps, that’s never been an issue. 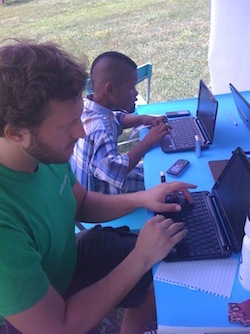 The PMC is a national service program that promotes and extends broadband adoption in underserved communities. It does so by placing technology, media production, and outreach fellows in residencies at underperforming high schools, public broadcast stations, and non-profit community organizations. The PMC evolved out of the New Media Institute, which was founded by National Black Programming Consortium (NBPC) in 2006 to train media makers of color in new media technology. The NBPC launched the beta of Public Media Corps in Washington, D.C., this June. 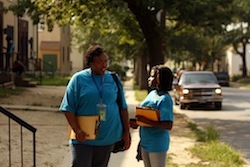 Since then, the group has worked steadily to collect information from the community to build projects based on the needs of people living in Anacostia (Ward 7 and 8) and in Columbia Heights, Mount Pleasant and Shaw (Ward 1) — neighborhoods that are home to predominantly African American, Latino and immigrant communities. “The fellows are working in teams and using survey tools to gather more quantitative information about the ways in which people use the Internet and social media and what issues and information sources are important to them,” said Jacquie Jones, executive director of the National Black Programming Consortium. PMC fellow Mike Janssen assists youth at 4th Annual Concerned Father’s Public Safety Day in Anacostia. Photo by Ashley Mosley. Starting this month, the PMC will begin using the data collected at Cool Spots to select three to four projects for the fellows and community partners to collaborate on and ultimately implement in communities for the final months of the D.C. beta. Building trust and establishing communication channels are often the first challenges of any large-scale collaboration. With so many people, organizations and communities involved, I was curious to hear just how the PMC staff, fellows and partners were tackling it. The PMC experimented with several platforms for sharing information electronically. The two that stuck were Google Docs and Dropbox, a web-based file-hosting service that uses cloud computing to enable users to store and share files. The fellows use Google Docs to collaborate on writing projects. They post their weekly reports and media to Dropbox. Ashley Mosley, a PMC fellow, video producer and community organizer, offered some perspective on the challenges and rewards of collaborating at this level. Another hurdle collaborations face is measuring success. When working with multiple stakeholders and communities, priorities have a tendency to become malleable and impact ambiguous. To keep the focus on results, the PMC has placed a high priority on collecting data throughout the six-month beta. The PMC is measuring levels of community engagement, use of public media resources, technological capacity of partner organizations and broadband adoption and patterns of use within the communities. In addition to collecting community data, the PMC will seek feedback on the performance of its fellows from a team of technologists and public media stakeholders, who will conduct site visits and one-on-one meetings with the fellows. In advance of the official 2011 report, I asked Jones and Shaw what they have learned so far from collaborating with the various community groups, fellows and the public on a project of this scale. As for the fellows, they offered some advice of their own for future PMC participants. A public relations and social media consultant, Katie Kemple works with public media clients to build community, develop strategic partnerships, and create integrated public relations campaigns. Over the past ten years, she has held positions at WGBH, WETA, Capital News Connection, and Public Media’s EconomyStory. You can find her every Monday at 8 p.m. ET on Twitter, as a co-host and organizer for #pubmedia chat.